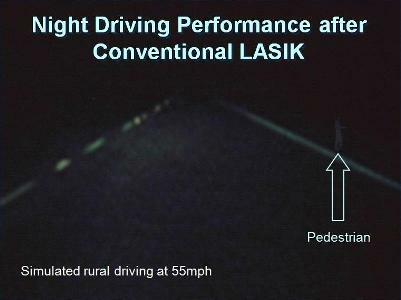 Nighttime vision may often be overlooked when discussing LASIK eye surgery. Many times glares and halos are mentioned as possibilities, but that is where it all stops. Most patients who have had LASIK surgery are so happy with their daytime vision that they accept the impurities of their night vision. However, night driving presents one of the most visually demanding task that we ever perform. A study by Steve Schallhorn, MD, et. al., published in the April 2009 issue of Ophthalmology, the official publication of the American Academy of Ophthalmology compared night time results of the standard Blade microkeratome conventional LASIK with the CustomVue Blade-Free IntraLase LASIK eye surgery (iLASIK). Patients treated at the US Naval Medical Center in San Diego, CA, with corrections of -4.50 D to -6.00 D were tested before LASIK and 6 months after LASIK in a Night Driving Simulator. They were scored on ability to recognize signs, see pedestrians, etc. An example from Dr. Schallhorn's 2007 Binkhorst Lecture is seen on the right. 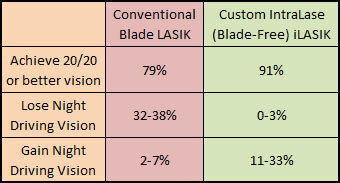 In the group of patients that had the Blade Conventional LASIK eye surgery, only 79% achieved 20/20 vision without correction. On the Night Diving Simulator 32 to 38% had a clinically relevant loss of performance, while only 2 to 7% had some improvement. Whereas, patients that had the iLASIK procedure (CustomVue with Blade-Free IntraLase Method), 91% achieved 20/20 vision without correction. On the Night Driving Simulator 0 to 3% had a clinically relevant loss of performance and 11 to 33% had an improvement. As you can see in the above figure not all LASIK surgeries are created equal and not all 20/20 vision is the same. In the above image both charts are seen at 20/20 "quantity level." However, only the image on the right has the desired "quality." 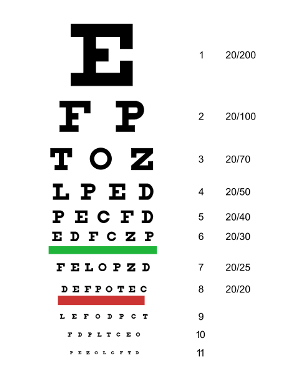 The term 20/20 refers to a way of measuring vision on a standard Snellen Chart. Dr. Hermann Snellen in 1862 (yes, at the time of the Civil War), developed a 100% contrast sensitivity black letters on white background chart. This ignores the capacity to recognize different shades of white, shades of yellow, gray, blue, ... Vision can be measured in Snellen Acuity, Contrast Sensitivity, Color Sensitivity and Recognition, Frequency doubling, field of vision, and more. Nighttime vision and driving present some of the most visually demanding tasks. The study above proves that iLASIK is the best procedure to preserve and possibly improve the capacity of individuals to see. This is the reason why even after FDA approved LASIK, it took 12 years until the US military finally allowed the TopGun pilots, Air Force pilots, and NASA Astronauts to have only the iLASIK procedure, and none other.